The premise of the book is that successful people aren’t self made men (or women) who pull themselves up by their bootstraps. If you look into the story of their success you can find that in addition to their talent they benefited from lots of good luck. You’ll have to read the book, but it’s more than just meeting the right person. For hockey players in Canada there is a strong bias for players born in January. Big leaders in the tech revolution were born in a few year window. It’s pretty fascinating stuff. 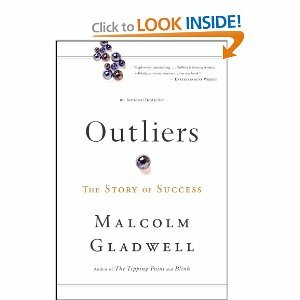 I liked Outliers a lot better than What the Dog Saw because it is a coherent book rather than a collection of essays and he relates the chapters to each other. I have one major critique of the book. In his conclusion he suggests that if we were more aware that great advantages were given out somewhat arbitrarily then we’d have more of the titular Outliers. In the hockey players example if the youth leagues were changed to not bias for birthdays early in the year then Gladwell thinks we’d have twice as many professional hockey players. I disagree that the size of the NHL is supply driven. It’s the market for watching games that determines how many teams and therefor how many players are in the league. Sure a more equitable system would have different players rise to the top, but the number of players wouldn’t explode. Likewise for big tech CEOs or robber barons: there only need to be a few CEOs regardless of how they are chosen. The selection process is flawed, but not the number that end up at the top. It’s still a great book, just a little flawed in the final few pages where he wraps it all up. I recommend you read it, especially if you liked Freakonomics.